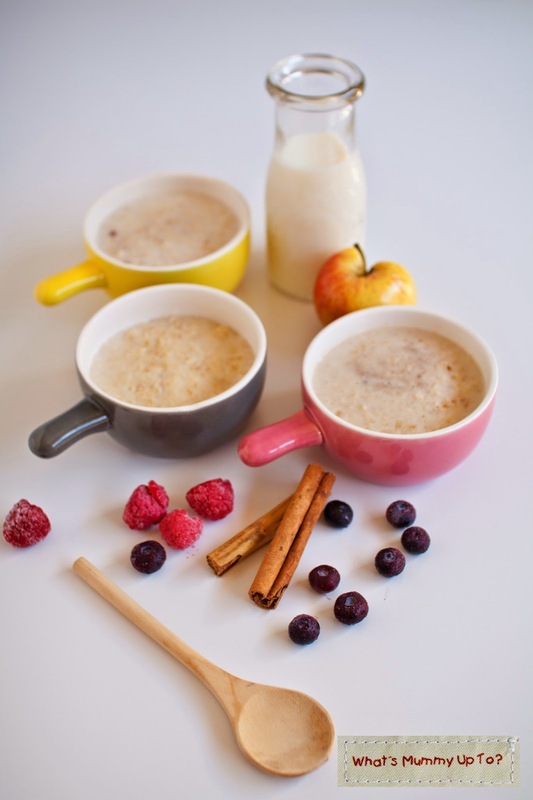 We love oats and porridge at our place. On those slower weekend mornings when we have some extra time, the girls love to climb onto their little step-stools in the kitchen and help me measure out the oats, water and milk, then stir, stir, stir on the stove until the steamy warm porridge is ready to go. 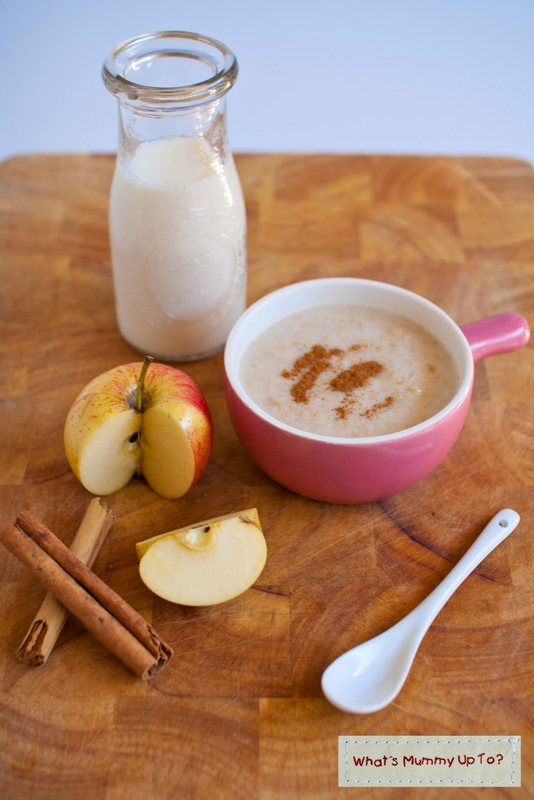 And there really is nothing better than warm oats on a chilly winter morning, huh! I love my oats plain, but I think the favourite part for my girls is adding the extra flavours. Bethany loves to add a sprinkling of brown sugar to her porridge (and a little extra straight into her mouth when Mummy's not looking .... or so she thinks! ), and Hannah absolutely adores a dollop of raspberry jam. In fact, it's funny to watch her as she dollops on her jam then dips straight back in with her spoon to lift the entire dollop straight into her mouth ... apparently it's much better that way and there's certainly no need to mix it in! Funny girl! 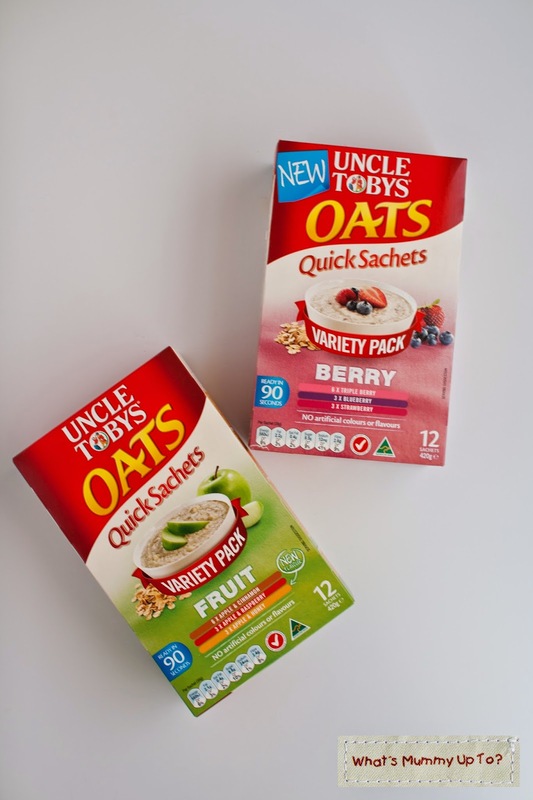 So when I was asked if I'd like to try some of the Uncle Tobys Oats Quick Sachets it was an easy yes for me. I have always used my traditional porridge recipe before now, and haven't ever bought these sachets, but I can tell you I now totally see the appeal. It is just so quick and mess free to make. 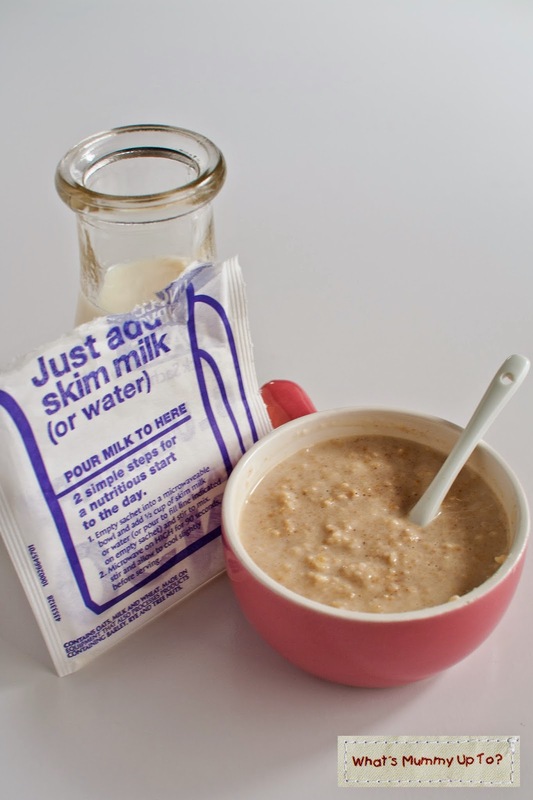 Just use a cereal bowl (microwave safe), tip your sachet in, fill the sachet to the line with milk/water, then mix that in to your dry mixture. Heat on high in the microwave for 90 seconds (my microwave must be a little stronger I think, 'cause we only needed about 75 seconds), mix an extra dash of milk to cool it down a little and mix it to make the oats super smooth and you're done. 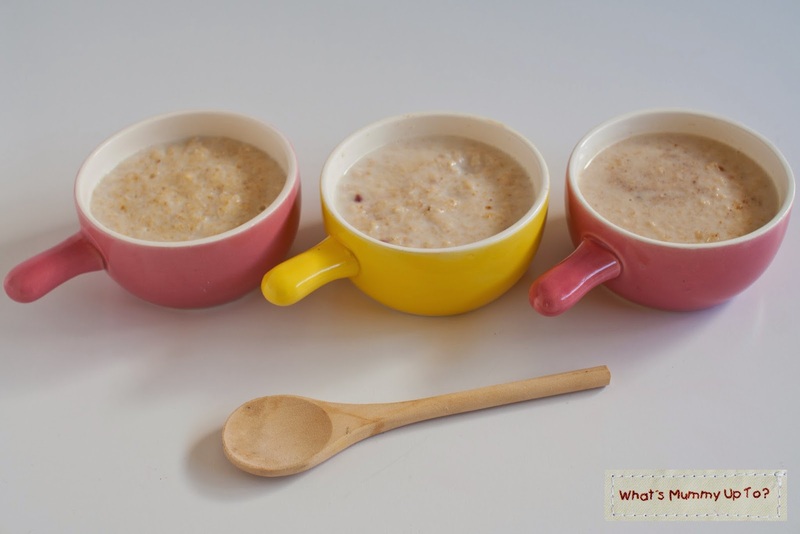 It's just as quick as cereal or toast would be on school mornings and still gives that feeling of warm deliciousness in your tummy on the super cold mornings like the ones we've had recently. Oh, and did I mention the line on the pack that you measure your milk with? ... how ingenious is that!!! You don't even need to dirty a measuring cup. I'm loving the nothing-extra-to-wash-ness about these oats. Each box comes with 12 .... yep, that's 12 sachets of porridge with a variety of flavours in each box ... On this particular day we tried Apple and Honey, Triple Berry, Raspberry and Strawberry ... but my absolute favourite was the Apple and Cinnamon. I just can't go past that flavour combination. And the girls are loving that they can pick a different flavour each time. 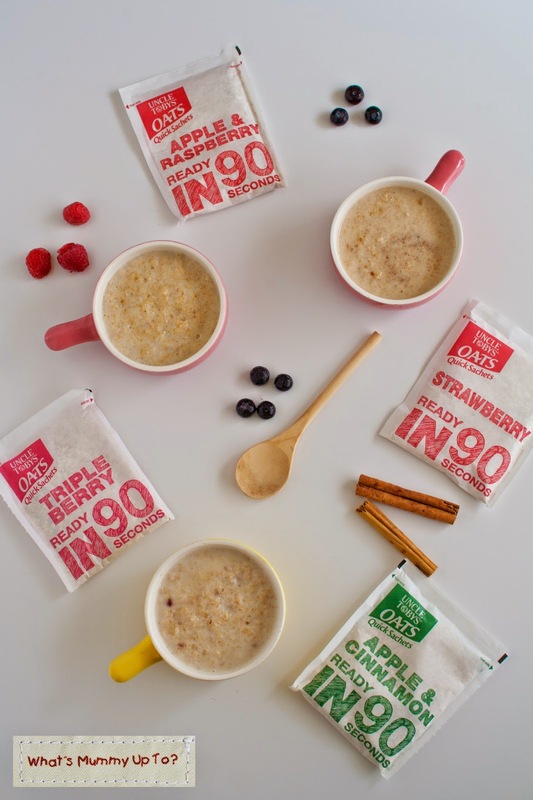 It keeps it interesting, and the bonus is that there are no artificial colours or flavours - you can see (and taste) yummy little pieces of dried fruit - and Uncle Tobys have always been known for their great quality wholegrain oats. When I was doing my grocery shopping today, my local Woolies was selling these boxes with lots of different flavours and even a high fibre or multi-grain option for $5. So compared to the prices of other breakfast cereals, and considering that this is for 12 hot tummy-fulls, I think it's pretty good value. And it's definitely better for the family than many of those sugary cereals anyway. 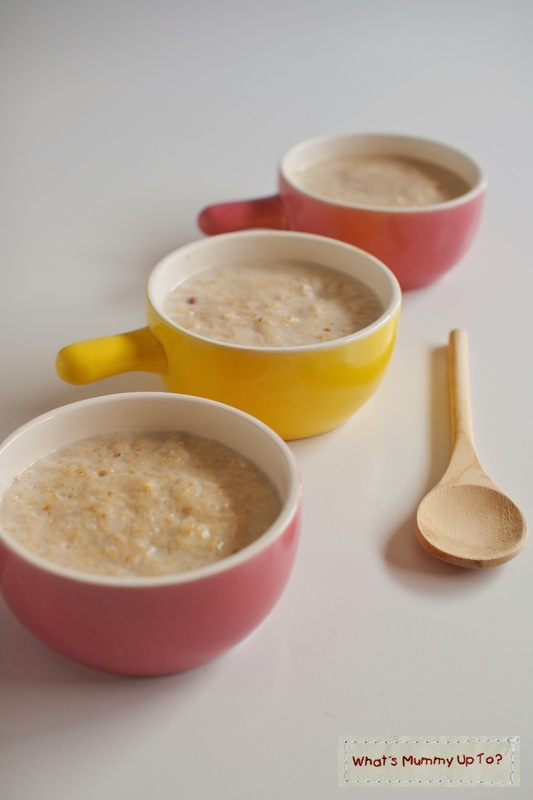 We've managed to totally avoid "those" cereals with our kids so far, and I love that they get excited about healthier breakfast options like oats. ...and maybe even for a snack at other times of the day too ... Ha ha - yep! When these arrived at our house the girls were so super-excited they just had to try one straight away ... for afternoon-tea. Is that terrible?? Well in our defence, it was a bitterly freezing cold afternoon and I have to admit that I sat down to a bowl of afternoon-tea oats with them. Yum, and oh so cosy. We slipped into our PJ's, snuggled under a blanket on the couch with a Tinkerbelle movie, and enjoyed a special oaty treat together. Just love those moments with my girls, and I'm soaking up as many of those moments as I can before the idea of snuggling with Mummy to watch a movie is no longer cool ... know what I mean? Oh, and yes, I was provided with these Uncle Tobys sachets in return for my review, but all opinions are my own.